Looking for Chicago condos for sale? You'll find all of the hottest downtown Chicago condo listings below! From their breathtaking waterfront views to all-inclusive, world-class amenities and adorned with the latest contemporary finishes, condos for sale in downtown Chicago are the true epitome of luxury living. No matter what community you prefer, these stylish buildings are drenched in the vibrance and electricity of the city. Just minutes away from all of your favorite downtown destinations, it's easy to find the perfect condo to complement your individual lifestyle, whether it be a trendy loft, dog-friendly suite, eco-friendly abode or an entire floor in one of the most regal buildings in the city. Some of the most prestigious addresses in the area can be found in the listings for downtown Chicago luxury condos. No matter what your preferences and expectations are, this city is filled with immaculate fine residences in the most desirable neighborhoods. Condos for sale in Chicago are always centrally located and just minutes from transit stations, boutique shops, global cuisine, a bustling nightlife, and some of the best urban living in the nation. Browse through each of the neighborhoods below to learn more about the areas and their respective condominiums for sale, or customize your MLS® search with our advanced search tools to find a condo that satisfies all of your needs and wants. 7,152 Properties Found. Page 1 of 596. A number of Chicago condos belong to the city's rich history and have been an integral part of the city's skyline for well over a hundred years. As the city grew and expanded outwards, there were some areas of the downtown that were protected to enhance the natural environment of the beautiful waterfront. Because of this, no matter what inner-city community you live in, you're never far away from preserved park space, perfect for after-work picnics, early morning runs, coffee with friends, and adventures with the kids. Breath in the fresh coastal air and relax on the beach or read a book in the shade beneath your favorite tree. It's easy to escape the urban jungle and get back to nature in downtown Chicago. 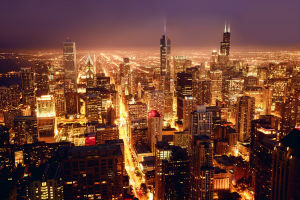 While many of the condos for sale in Chicago are well-appointed for affluent buyers, there's something for everything in these listings, from simple starter spaces to sprawling awe-inspired suites, if you're looking to live in the middle of it all, it doesn't get much better than this. In addition, many of the condominium communities will include a terrific selection of exclusive lifestyle amenities that you can enjoy without having to set foot outside of your building. These can include pools, spas, fine dining, pet spas, rooftop lounges, wellness centers, among many others. Do you want to know more about the condominium real estate market? Contact Andreas Holder by sending him a message or giving him a call at (312) 893-3560. He'll he happy to arrange a time that works for you to meet and help you find a place that perfectly complements your wants and your needs.